Dr. Samson Hettiarachchi has 33 years of experience as a college lecturer, researcher, innovator and a technologist. He has held a variety of technical positions at GE Nuclear Energy as Chief Engineer/Physical Sciences, Chief Technologist/Chemistry, Engineering Fellow and Principal Engineer prior to his retirement from GE in February 2011. Prior to joining GE, he held the position of Electrochemist/Senior Electrochemist at SRI International (formerly Stanford Research Institute) and the position of Lecturer/Senior Lecturer in Chemistry at the University of Colombo, Sri Lanka. Two of his innovations at GE Nuclear Energy, NobleChemTM and On-Line NobleChem are widely used in the US, Japan, Spain and Switzerland to extend the life of Boiling Water Nuclear Reactors. Dr. Hettiarachchi’s research experiences include Physical Chemistry, Electrochemistry, Surface Chemistry, Catalysis, Corrosion and Mitigation of materials, Battery Technology, Sensor Technology, and In-situ Generation of Nano-particles. He has worked in the nuclear power industry related work for about 25 years. For many years he has participated in EPRI BWRVIP Mitigation Committee Meetings and several IAEA Meetings. He has over 100 publications in International Journals and International Conference Proceedings and holds 27 issued US patents. 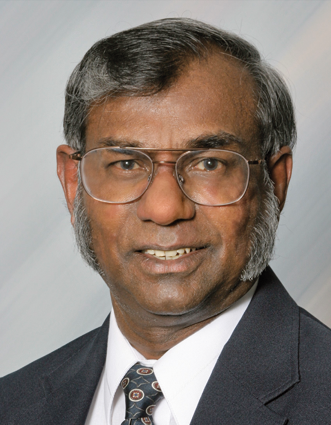 He has been a peer reviewer for the Corrosion Journal and the Journal of Nuclear Science and Engineering. I did an Honors degree (B.Sc) in Chemistry at the University of Colombo, Sri Lanka, and then completed my Ph.D. degree at the University of Cambridge, England in 1976. My post-graduate work was on the electrochemical corrosion of high nickel alloys. After the Ph.D. degree, I served the Chemistry Department of the University of Colombo as an Assistant Lecturer/Lecturer/Senior Lecturer in Physical Chemistry until 1983. When my sabbatical leave was due, I joined the Ohio State University where I developed zirconium based high temperature pH sensors for both nuclear and fossil power plant applications. Thereafter, I joined SRI International (formerly Stanford Research Institute) to work on a variety of electrochemical and corrosion research projects that included research on lithium batteries, oxygen separation from air, corrosion of concrete, corrosion of aircraft materials, corrosion of nuclear reactor structural materials and development of ECP and pH sensors for BWR, PWR and fossil power plant applications. In 1991, General Electric Company hired me primarily to develop and introduce zirconium based ECP sensors for BWR in-reactor applications. During my early career at GE, I also worked on the stress corrosion cracking of stainless steels and nickel alloys, and also on the corrosion of zirconium alloys. I invented both noble metal injection and on-line noble metal injection technologies that are widely used for SCC mitigation of BWR structural materials. I have worked at many BWR plants in the US, Japan and Europe conducting HWC tests, and led many noble metal/on-line noble metal applications in the US, Japan and Europe. In the nuclear division of the General Electric Company, I held the positions of Principal Engineer, Engineering Fellow, Chief Technologist/Chemistry and Chief Engineer/ Physical Sciences, until I retired from GE in February 2011. I have also been actively involved in the mitigation committee meetings conducted by EPRI. My specialized experiences are in Chemistry, Electrochemistry, Corrosion and sensor development for nuclear power plant applications. I have authored or co-authored over 100 papers in Journals and Inter-national Conference Proceedings, and hold 27 US patents. After retirement, I am consulting for a few organizations in my areas of expertise. How did you get introduced to ANT International and the LCC Programme? I was introduced to ANT International simultaneously by both Bob Cowan and Francis Nordmann. My friend Peter Ford, whom I have known for almost four decades, also encouraged me to join ANT International. How has the field of water chemistry issues changed during your career? When I joined the BWR field, zinc injection has just begun for dose rate control, and the focus has shifted more towards IGSCC mitigation of reactor internals. When I came with the idea of injecting noble metals in to BWRs, it created a paradigm shift and there was a great deal of resistance to add chemicals in to BWRs that are meant to operate with pure water. Overcoming this resistance was a challenge that created a major water chemistry change to operating BWRs. What do you foresee for the future in the nuclear industry and how does the LCC Programme fit in? I think the nuclear industry will continue to be a part of the energy mix in developed countries. The LCC Programme provides a platform for close technical inter-action between plant operators and other BWR experts to make continuing improvements to operate plants safely and cost effectively. In addition, LCC Programme also provides a training ground for younger engineers. I am an avid cricket fan and a keen tennis enthusiast. I watch and play both these sports whenever I get an opportunity. I also do gardening and meditation to relax and calm my mind. My wife Kanthi and I always look forward to traveling to Sri Lanka once a year.